Recently, President Chavez of Venezuela succumbed to cancer. Several months prior to his death Chavez appointed Nicolas Maduro, his long time Minister of Foreign Affairs, as his future successor. Strange though it may seem, it is a known fact that now acting President Maduro is a fervent devotee of the late Sathya Sai Baba. Many refer to Maduro as an inconsequential puppet of Chavez, a former bus driver, but this does him no justice. Maduro is a descendant of the very influential Maduro clan, who hold positions of power in Central and South America, and have done so for decades. He is a well-educated and well-connected man, though he makes it increasingly hard to believe the former, judging by his recent rhetoric. In his announcement of the demise of former president and despot Hugo Chavez, for instance, Maduro (meaning ‘the mature’) ranted against the United States and accused the West of poisoning Chavez with cancer. A year earlier, he called his political opponents ‘big faggots’, something no one would expect from a man who is widely considered a thoughtful pragmatist. But then, birds of a feather flock together, do they not? Maduro was handpicked by Chavez and Chavez himself was not unlike Sai Baba in his latter days, come to think of it. Both advocated very outlandish ideas, to say the least. Chavez e.g. suggested in public that ‘the civilization of Mars had been destroyed by capitalism’. Doesn’t this sound as abstruse as Sai Baba’s declaration that he was himself an enormous magnet or that he would lift mountain ranges? 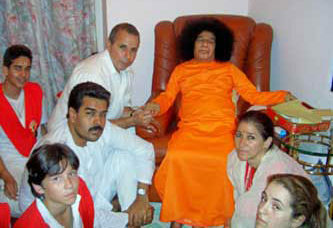 Maduro and his wife did visit Puttaparthi in 2005, as Robert Priddy mentioned in his blog of March 19 (Sai Baba was visited in 2005 by Nicolas Maduro of Venezuela), and is publicized widely and uncritically in India and in western newspapers (New York Times, Washington Post). 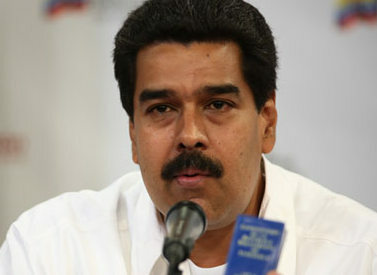 In this photo mr. Maduro can be seen during his ‘private’ interview with his Late Greatness. Opposite him sits his wife Cilia Flores, an influential lawyer. The orange-clad guru looks decidedly masklike to me, inane, near-dead, like he increasingly did during the last ten years of his ‘reign’. 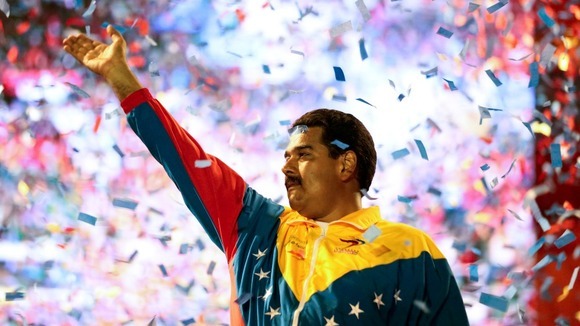 Talking of power brokers and outlandish ideas, Maduro, the Incumbent, has made headlines again two days ago. It seems he has cursed, yes CURSED all those who do not vote for him in the upcoming elections: so much for walk your talk, and help ever, hurt never! Read and shiver! This piece was published on ITV News. Venezuelan acting president Nicolas Maduro has said a centuries-old curse would fall on the heads of those who do not vote for him in next week’s election to pick a successor to late leader Hugo Chavez. Maduro’s invocation of the “curse of Macarapana” was the latest twist in an increasingly surreal fight between him and opposition leader Henrique Capriles for control of the South American OPEC nation of 29 million people. “If anyone among the people votes against Nicolas Maduro, he is voting against himself, and the curse of Macarapana is falling on him,” said Maduro, referring to the 16th-century Battle of Macarapana when Spanish colonial fighters massacred local Indian forces. This kind op political browbeating puts him in a league with people like russian Prime minister Putin, who visited the Netherlands yesterday, only to be met with the largest pro-gay demonstration he has ever witnessed (You could almost hear him mumbling: ‘Big faggots!’). In earnest, if this is the kind of man who calls himself a devotee of the Sai Baba movement, he is the latest in a pitiful yet long line of both Indian and foreign VIPS who, for their own intents and purposes, coveted the now deceased saffronwearing, bushyhaired guru from Parthi.